Imagine a boxer who never spars with a training partner. He skips rope and punches a punch bag to prepare for fights. The only time he ever gets to learn and experience fighting, is in an actual fight. Imagine a rugby team that runs around the field for fitness. They stand in a circle and pass the ball to each other to practice ball skills. The only opportunity they ever get to learn to play rugby, is by playing matches. Or, perhaps more relevant, imagine a slalom paddler who only practices gates on flatwater. Her only experience of paddling through gates in a rapid is when doing slalom races. This sounds ridiculous, right? The funny thing is that this is exactly how many paddlers approach their river racing. Too many paddlers only ever see rapids when they do river races. All of their training is done on flatwater. I know this because over the years I have been a spectator at many races where I’ve seen paddlers take wrong lines and brace through rapids without really knowing what they’re doing. I know this because I’ve been there myself a long time ago, doing river races with very little experience, thinking that I know what I’m doing because I didn’t swim. Finally, I know this because at the last few races I did, I ended up in front of paddlers who were much fitter than me, simply because they lost valuable time swimming through rapids where I didn’t. It is simply not possible to learn much about rapids when racing through them. You have a split second to choose a line, and often the decision is to just follow someone else’s line without even knowing if the other paddler knows what he is doing. Then, you hope for the best, paddling and bracing and cranking the rudder to try stick to the line. Often this leads to swimming and/or breaking a boat, and even when you make it through safely, all you have learned is how to perfect your brace. To learn the nuances of rapids, you need to spend time in them. Relaxed time where your focus is on understanding, not racing. You need to run rapids over and over to try different lines. Instead of just paddling straight through a rapid, you need to play in it. Catch eddies, do ferry glides. Learn what the shape of every wave means. Learn how to differentiate between ugly pourovers and safe drops. Learn how to interpret the lines on the surface of the water. Learn what happens when your boat is deflected on an eddy fence, and how to react when your paddle blade slices through turbulent water. The best way to learn these things is to trip rivers, preferably with experienced paddlers who are willing to share their knowledge. Take your time; it is not a race. 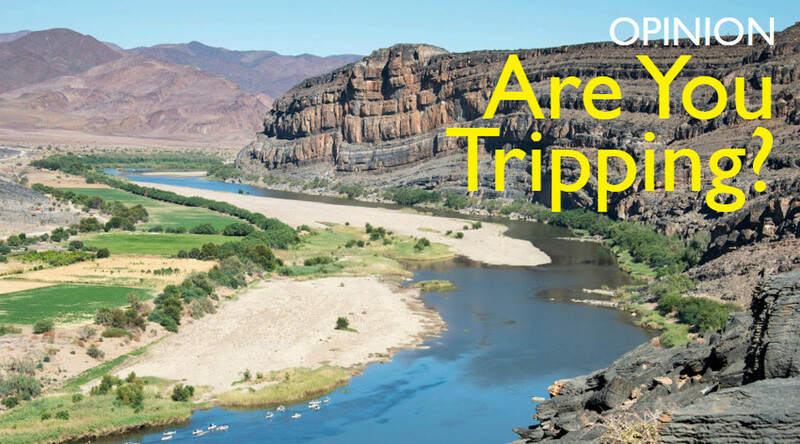 Tripping does not have to be on the river that you intend to race on. In fact, try not to spend all your time on the river that you intend to race on, because inevitably your focus will be on finding the fastest, safest routes on that river, instead of improving your general knowledge of rapids. If you don’t know any experienced paddlers, consider doing a course with a coach who specialises in river skills. Be honest with yourself and the coach about your actual skill level. I’ve seen too many paddlers doing courses and learning nothing, because they came to the course with the ego of ‘I know what I’m doing, because I’ve done Dusi / Fish etc’. Also, learn proper boat skills and paddle strokes. Learn how to edge your boat to use the current. Learn how to steer your boat without a rudder; one day, your rudder will bend or your rudder cable will snap. Learn safe bracing techniques and learn how to do bow rudders, sweep strokes and draw strokes. Broaden your scope by paddling different kinds of boats. Use super stable boats in rapids to really focus on the river, instead of focusing on keeping balance. Play canoe polo to help you learn better boat control and the effective use of different paddle strokes. The list goes on, but the point is, make time to learn different skills that you can use on a river. Get your fitness training in on flat water, but trip rivers to learn about rapids.